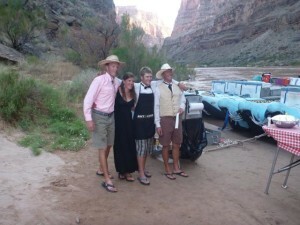 Grand Canyon River Ride Exceeded My Expectations!! The Western River guides were absolutely fantastic: Wiley, Micky (Mikelle), Lindsay and Newty went out of their way to be helpful and entertaining. The ride through the Grand Canyon was awe-inspiring and the side hikes were really fun. The food was yummy and plentiful, and the guides made sure everyone had something they could eat, even the gluten-free folks. I only wish we had more time to visit in camp, take more side-hikes and just "hang" for a bit in this sacred place.